What could be next for Fair Park? Stern talks with the State Fair! Green space! Booking the Band Shell! The Park Board on Thursday got a marathon first look at the new, privatized future for Fair Park. If there was one takeaway from the presentation and the hours of subsequent questioning, it was that the professionals have finally arrived. All the Park Board and the City Council have to do is say yes. One of the same firms that helped program Klyde Warren Park and dozens of others promised to move quickly to build a community park somewhere within its 277 acres. And, most of all, the folks behind the plan believe the deal will reinvigorate Fair Park and actually attract residents throughout the year for purposes large and small. 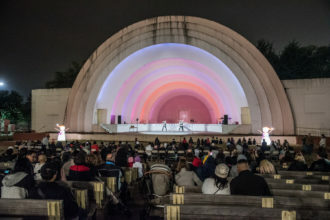 The bandshell, alive! Sort of. The board meeting was held in a larger room at City Hall to accommodate more than a dozen out-of-town guests. The corporation Spectra, the hopeful managing partner, made available many of their high-ranking staffers. Dan Biederman, the president of Biederdman Redevelopment Ventures, was present to answer a slew of questions about the park and the comprehensive plan for the park that his firm is charged with creating. And Fair Park First, the nonprofit of mostly locals that will oversee the new look, fielded questions about oversight and how it would treat the park. Biederman answered first, saying his people aren’t planning to “subtract” any activities currently happening. He said his group will be focused on adding activities “that fill the holes between events or bringing things that can be done within the buildings on different days of the week.” And later he zeroed in on the Fair’s footprint and the design of the community park. He characterized the forthcoming discussions as “aggressive but genteel,” saying that there was probably some time that could be shaved off of the Fair’s annual period of dominion over the park. The Fair has from August 1 to November 1 to set up, hold the event, and take it down. It was too soon to describe the amount of green space or the design of the community park, but Biederman is eyeing the area around the old Science Place by the Lagoon. Should the City Council approve the deal next month, Biederman anticipated experimenting with programming in the area next summer, with a functional park opening around spring of 2020. “If you guys give us the go-ahead, I think we’d be giving more definitive answers to those questions early in 2019,” he added. Spectra knows what it has to do to make its numbers. The city is only on the line in operational costs for $34.5 million over the next decade; it was spending about $11 million annually on operations at Fair Park after revenue was accounted for. The two other bids for Fair Park, from groups led by former Hunt Oil Co. chairman Walt Humann and local developer Monte Anderson, asked for about three times as much as the winner. In all, the city should save between $70 million and $100 million over the next 10 years. But Fair Park First has yet to set hard performance metrics, and Spectra’s pro forma isn’t in the public briefing; it’s contained in the formal contract, which state law blocks from making public until (or if) the City Council OKs the deal. In addition to new revenue generated by events and sponsorships, Spectra also believes it can save money on expenses by getting better group deals on things like liability insurance and utility savings. Spectra had answers to pretty much anything the Park Board threw at them. It planned on re-interviewing all of the existing employees. It would pay an hourly base of $10.94 and vowed to up it to $11.15 once the City Council approves that amount for its other contracts. Marcel White, Spectra’s VP of human resources, said he planned to target seniors, single parents, and students for work. He also noted that “diversity is getting invited to the dance. Inclusion is being asked to dance,” and said the company provides anti-bias training. It wasn’t going to cancel any existing contracts, but would rather analyze their numbers in search of efficiencies that could lead to cost savings. The group’s meetings and reports will be subject to the Texas Open Records Act, and the Park Board and the City Council will need to OK any capital projects worth more than $250,000. There remains a significant need for capital improvements at the decaying Fair Park. The global services firm AECOM estimates that it will cost around $250 million to tackle the deferred maintenance. Some on the Park Board expressed concern that the age of the buildings may deter some promotors from booking events at venues like the Cotton Bowl, especially considering the recent building boom in music and sports venues throughout the region. Zingoni argued that the asset of Fair Park—its location, its size, its character—combined with the group’s existing relationships will make it competitive in the marketplace. He also saw it as an economic driver for the beleaguered neighborhoods surrounding it. He promised to include local artists; it’s hard not to think of the South Dallas Cultural Center and the impact it could have, which sits in the shadow of Fair Park. “We’re going to take a look and identify the events from a financially effective approach, making sure we’re not just driving events to the park for the P&L, but also for the surrounding communities, that we’re offering job opportunities as well,” he said. The community engagement portion can start now. The Park Board has scheduled a special meeting Thursday evening for the public to voice their thoughts about the plan. (It’s at 5:30 p.m. at the Hall of State.) Darren James, the board president of Fair Park First, says the public outreach will now begin in earnest, and Biederman promised to hold off on the design of the community park until actually hearing what the community wants. James also promised to add another board member from the neighborhood in the coming weeks. Fair Park First has signed its contract with Spectra, which links the company to Fair Park’s operations for the next 20 years. Legally all that’s left is the recommendation from the Park Board and the OK from the City Council. None of the parties can change the terms of the contract at this point. What can change are the plans for the park, the programming and the design and the strategy of turning a barren fortress into something welcoming. It is time to turn to the most important element of all, which has too often been passed over when considering how to run the park itself: the people, whose voices may finally be heard. Correction: An earlier version of this article misidentified Biederman Redevelopment Partners as the landscape architect for Klyde Warren Park. That was incorrect; they consulted on operations and programming. OJB was the landscape architect.